Sewing is a fine craft and hobby that can useful in fashion or fun. It is a great skill for anyone who enjoys creativity or mending clothes. Some might think that sewing is just for professionals and it is difficult to do, but it can be easy to learn and do regularly if you want to do it as a hobby. This is true even for children. Yes! The skill of sewing can be learned at ages as young as six years for kids. With the best sewing machine for kids, your child can be as creative as he/she wants to be. Many of them even include accessories for a handful of delightful projects. Learn more about the top kits here. With a cute design, the Janome Hello Kitty 15312 is an easy-to-use and lightweight 13-pound sewing machine for kids. It comes with 15 stitches, a 4-step buttonhole, and front-loading bobbin mechanism. Despite its light frame, the interior metal frame is heavy duty. It’s an ideal feature-packed sewing machine for beginners with plenty of accessories and comes with a 3-piece dog system. In addition, the free arm is removable for convenience. The periwinkle blue color with red star patterns is attractive for the little ones. In addition, setting up the 15312 model by Janome is easy, and the diagram makes it easy to follow and complete the tasks. Your child can do 15 different stitches with a lot of creativity, and with the buttonholes, the dials at the front are a nice addition to easily adjust the stitch length and zigzag width, while the stitch selection is at the side. 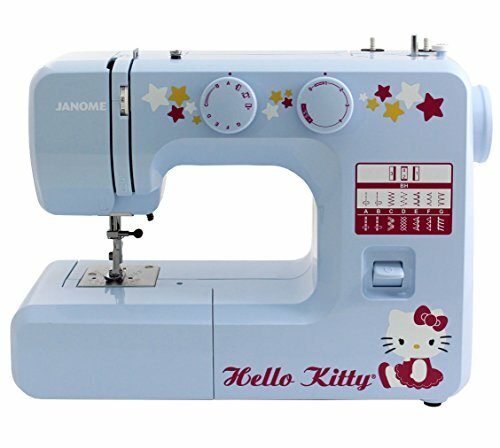 The Janome Hello Kitty 15312 sews effortlessly and can even be used for adults. This is an ideal pick with just the right features for kids. 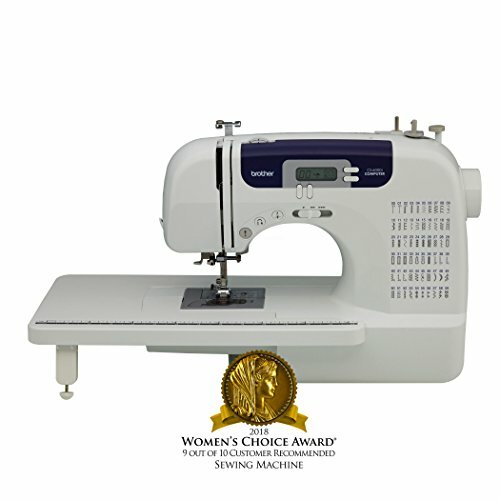 Setting itself apart, the Brother CS6000i model sewing + quilting machine is a steal as it’s packed with features and is affordable. Computerized sewing machine for teenagers is convenient as the setup is automated. It’s got a number of accessories like the hardcover for starters. It’s also got a cleaning brush, bobbins, eyelet punch, spool caps + pins accessory pouch, eyelet punch, oversized table, needle set, ripper, and nine types of presser feet. That’s a load of features and versatility too. For starters, setup is quick. That’s thanks to the virtual, computerized technology. You’ll also discover a numbered diagram on all the threading spots that enable your child to thread at the very first stages. Once threading is complete, needle threading is next with the help of a lever at the machine’s side, and the sewing machine finishes up the job. Once threaded, you’ll move on to the automatic needle threading system. This system allows you to press a lever on the side of the machine and Brother takes care of the rest. You don’t need to sit there poking your fingers or trying to get the thread in the eye of the needle for 20 minutes. Threading is done automatically once the lever is pressed. A diagram is included that shows you how to use the Brother’s auto-bobbin winding mechanism. What we really love is the stitch selection and customization as there’s 60 of them to choose from. With a quick press of the button, your child can pick stitch width and length. This is a more advanced version of a sewing machine with many features, and not very pricey, too. 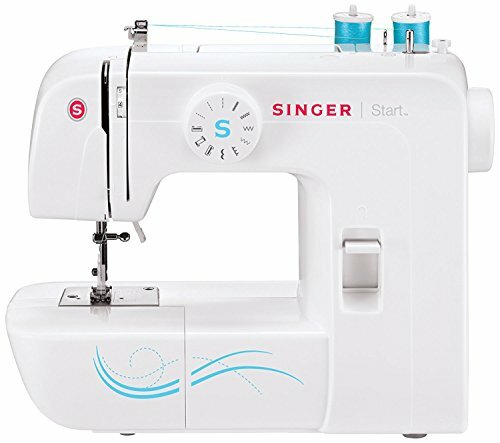 Simplistic in look but modern in features, the SINGER 1304 sewing machine (w/ LED lighting) for children has 6 basic stitches that have inbuilt pre-set stitch width and length settings, and with a quick turn of a dial. It’s ideal for beginners, and children up to ten years old as it’s easy to use with options from basic sewing to zigzag. Your ten-year-old can add buttonholes and easy-to-make pillows to pet clothing. It’s one of the most affordable sewing machines finds around and already with lots of features for beginners. Despite its small size, its interior frame is robust and easy to carry. We love the basic white color and blue accents. The removable extension table makes it convenient for hemming with smaller-sized fabrics, while the removable free arm enables your sewing beginner to work with parts like cuffs or hems with great ease. Janome has always been a trusted brand for beginner, intermediate or advanced sewing hobbyists or professionals. 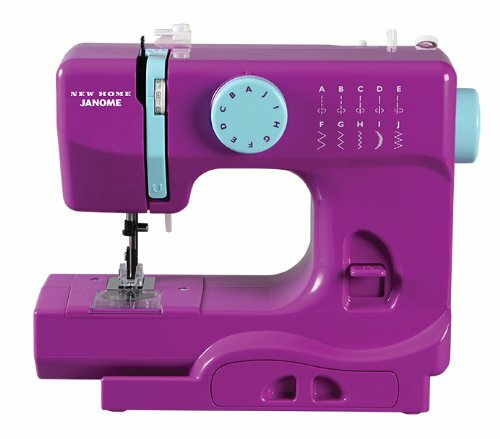 With ten stitch options, the Janome Purple Thunder sewing machine is a top choice for novice sewers–even six-year-olds. It’s basic, compact and weighs just 5 pounds. It’s a good choice for beginners, especially children, and comes with just the features he/she needs for creative fun. Whether it’s simple sewing, crafting or scrapbooking, this is a nice item to take to school, art class and share with friends. There’s four stitches: straight, crescent, zigzag, and multiple zigzags, plus another six-stitch length and width variety. That’s a total of 13, and that’s a great variety! Additionally, an inbuilt 4-piece dog push-pull bobbin winder and a presser foot that’s extra high make this cute purple sewing machine for kids a top choice for novice sewing. The single foot pedal speed is convenient and performs very quietly. The Purple Thunder sewing machine for kids also has security in mind with a finger guard. We love the free arm sewing that your child can easily operate. It’s an ideal sewing machine for children. In addition, there are up to nine color options besides purple! The instruction manual is easy to follow for your kids. Look no more if you want your child to begin well and good at sewing, as Janome is a perfect match for those eager-to-learn fingers. Creativity and fun all the way! What Makes a Good Sewing Machine for a Child? Teaching your children a good skill is important and sewing is one hobby that enables them to practice their creativity. Sewing machines for kids are relatively easy to use despite what you may think. In this section, let’s look through the aspects or parts you need to check before choosing a good brand for hobby use. The sewing machine’s feet need to be solid and durable. The best kind are the ones that attach with a screw. Unlike the snap construction, these feet don’t give the child to reason to place their fingers in danger. It’s not a great idea to buy a cheap sewing machine with low-quality construction. A common issue with younger kids is that they can experience difficulty when using the standard pedal. The ideal choice would be to pick a brand that has a push button with the pedal. This will provide a stitch speed that is consistent. As mentioned previously, consistent speed is important in a beginner’s sewing machine. With a consistent speed, garments will be made precisely, and your child won’t lose control even if the pedal isn’t being. When using a push-button model, you’ll want a machine that has a consistent speed. This will allow for clothing pieces to be made with precision and won’t lose control. This factor is dependent on the size and age of the child. Typically, five pounds is a safer choice than fifteen. See if your child’s weight and size meet in the middle with the weight of the beginner’s sewing machine. The younger the child, the lighter the machine should be. Needle-threading can be challenging in the first few times especially for a child. Choose a starter sewing kit for him/her that comes with diagrams that are easy to follow so your little one can practice. There are also auto-threader types if your child really has trouble putting the needle in. Your child’s first sewing machine must feature a bobbin slot that’s easy to install, quick to find, and finally easy to open for one that has such small hands. A good bobby winding makes it effortless for the child to install. Some models can be overly complicated with features that include dozens of stitch choices. For a sewing beginner, don’t go over the top and buy the model with too many options. A couple is good enough for a child just beginning to sew. For example, there are models with six options as standard, and it can go up to more than twenty. Basic stitch options include stitches such as straight or zigzag. Children can easily break things. Be sure the sewing machine you’re planning to get has the warranty tag. Learning to sew at a young age is not a tough task for children. In fact, sewing is a good skill to hone at the developing stages because it fosters creativity and allows your child to make clothing, toys for pets, and more. Sewing is more than just a creative outlet; it promotes self-esteem. First beginning to sew at home is great because not many schools have a wide range of creative art programs. It starts with the guidance of the parents. A child’s recommended age to begin sewing is six years old, but there are some that start at 3 years of age. These children can quickly advance to more challenging patterns of sewing. In fact, kids that start sewing earlier know how to protect their fingers from the presser foot and have a better safety awareness than those that begin to sew a little later. Another benefit to sewing is training hand-eye coordination. Regular practice of the hands working with the eyes is good for him/her. The best kinds of sewing machines for kids are models that have all the same real features of an adult sewing machine, without taking away the safety measures. They should be lighter for a child and equipped with safety features so that problems like accidental pinching won’t be problems anymore. Additionally, sewing isn’t a serious business unless you’re doing it commercially or on a large scale. Sewing should have a mindset of fun with many available designs or characters to choose from and make. Especially when kids are enjoying these patterns, they’ll want to sew more and eventually upgrade to something more advanced. This encourages them to keep learning about sewing and advancing their craft. The right sewing machine for your young son or daughter should match his/her ability. Typically when starting out, your child is in the beginner level. Then he/she will move on to intermediate then advanced. Note that you don’t have to buy expensive sewing machines with numerous patterns only to find out your child may have a hard time. Allow his/her young fingers to get the hang of things, dexterity to improve, particularly in the pedal area. As your child grows older, dexterity with the fabric also improves. Many entry-level sewing machines are being made, and we want you to be wise in picking the best one! You should take away the notion that sewing is difficult, in fact, why not begin as early as six! Here are a few tips for your learning child. The mass manufactured sewing machine versions for children in the market are usually standard models. As mentioned earlier, standard types are good for starters with a handful of stitch options. But if your child has been on the hobby for some time, an embroidery-only machine is the next course. This is an exciting machine that can produce creative patterns, opening up your child’s artistic skill and encouraging creativity. In fact, there are models that are WIFI-capable, which makes it great for downloading new patterns to try out. Another popular sewing machine type for children is the serger sewing machine. These sport multiple threads and can create a safety hem and can further improve your child’s skills in sewing. Sooner or later, with much practice, your little one will learn to have better control on thread tension. As a parent, you should never compromise safety when it comes to buying your kids things and toys. There should be safety features that ensure the child is safe always. Moreover, don’t buy your child things that can be quite difficult to understand especially when their brains are still developing. You don’t want to overwhelm them, which can result in confusion and drawbacks. Sewing is indeed a great way to hone creativity, hand-eye coordination, and dexterity. What’s funny is that it can look challenging for first timers, but what’s awesome is that there are many products made, and even for children at their developing stages. This just goes to show that any craft can be turned into true talent when practiced long enough. Based on the above products mentioned, these are the best products we consider should train up your child to his/her sewing hobby or perhaps a career in the future! They’re durably packed with the best features and produce fun patterns and designs your child can treasure and look back on for years. Sewing isn’t that hard at all when you have the right guide and the appropriate supplies. Remember that as a parent, you should always practice safety measures and supervise your little one at their early stages of learning to sew. Fingers are important, so it’s crucial that you protect them from injury! You can make paper crafts, pet garments, and other clothing items with a good sewing machine and a bit of practice. When you are ready to start seriously considering buying a good quality sewing machine, review the factors that make a good sewing machine before choosing the best kind for your enthusiastic child. More doesn’t always mean better; sometimes, a few good stitch selections are enough for a creative, enriching, and educational time. Now sew away!